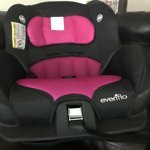 Ensure safe seating for your little one in the car with the Evenflo Tribute Convertible Car Seat. It is designed to meet all the Federal safety standards and Evenflo's side impact standard. This Evenflo convertible car seat comes with multiple shoulder harness positions to offer the right fit for a long use. The 5-position harness secures your child to the seat at all times. It features integrated head and body pillows and dual-positioning foot recline that offer comfortable seating. They are removable and washable. 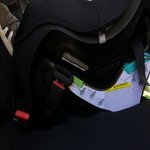 This baby car seat comes with a latch for easy installation in your car. You may choose to use it as a rear-facing or front-facing car seat. 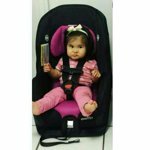 The Tribute Convertible Car Seat can accommodate children between 5 and 40 lbs in the rear facing position, and 22-40 lbs in the forward facing position. I feel that my grandson is safe and protected in this car seat. It has to lock down straps he can be jostled all around and doesn't go anywhere. It's just a really good car seat! 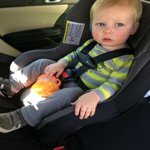 Great car seat at a great price! This car seat has worked great for us. It was easy to install in the car, easy to tighten and loosen the straps each time. Cup holder is a nice addition and fits just fine on the side of the seat. Not too big for the back seat (can still fit two people comfortably in the back) and my daughter loves it! 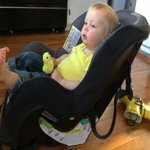 We had previously bought the cosco apt 50 for our other car and this one is much easier to use and seems more comfortable for our daughter, and looks nicer too! 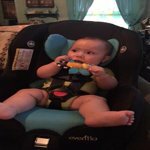 I love this car seat my baby enjoys road trips. She use to cry everytime I put her in her infant car seat and now she enjoys going for a ride in her new car seat. This does exactly what I need it to do, my daughter is comfortable in it. I like it so much that my sister bought it for her son and mom bought it, so we now have 5 of this exact car seat! The color scheme is very cute. It is sturdy and seems secure. However, I drive a Hyundai Accent and I prefer to stay far back from the steering wheel. The car seat in the rear-facing position is too large for me to pull my seat as far back as I'd like when the seat is in the middle. If I put it behind the passenger seat, that must be upright entirely and the seat more forward. This is assuming I do not have any of my other family members in the vehicle. If my husband were driving, the seat could not be in the middle at all. I'm 5'2" and he's 6'2". He would not be able to pull the seat back far enough, rendering his legs too crunched for safe driving. It will be better in the forward-facing position for a small vehicle. We, as grandparents, wanted a carseat to tote our grandkids around. This one fit our budget and is easy to use. Does not have all the bells and whistles of the more expensive models. But works well for our purpose of short occasional trips around town.